This is a common question we're asked when we find defects at houses that we inspect, and the answer is always no. While we may come up with a big list of required repairs for a seller during a Truth-In-Housing evaluation, home inspections are entirely unregulated in Minnesota. No licensing, no regulation, nothing. Issues that come up during a home inspection may be negotiable, but there are no hard and fast rules about repairs that sellers need to complete as a result of a home inspection. When we find defects during a home inspection, there are four common ways for the buyer to deal with them: pay less for the house, cancel the purchase, have the seller perform repairs, or do nothing. Today I’m going to give my two cents on these different options. Lower the price of the house. With this option, the buyer can hire their own contractors to do the work, and they can oversee the whole project after they own the house. This is a common approach, but it's not always a practical approach because it doesn't leave the new home buyers with any cash to pay for repairs. Cancel the purchase. This happens when the buyer decides there are too many problems with the house or when buyers and sellers can't come to an agreement. Ask the sellers to make repairs. I'm not a fan of this option. If a seller has performed work at their home and it was done wrong, why would they get it right the second time? When a buyer asks a seller to repair things, they are basically making the seller the general contractor for their new home. The seller has no motivation to do high-quality work, and I know from experience that the work will often be performed incorrectly, or the work will be sub-par and the materials will be the cheapest possible. Often both. It’s a very frustrating situation for buyers when we go out to verify repairs the day before closing and none of the repairs are right. What happens now? If the seller is going to be responsible for repairs, language should be included in the purchase agreement that requires licensed contractors to do the work, permits pulled and inspected by the authority having jurisdiction (the city), and proof of both given to the buyer well in advance of the closing date. Just about anything related to plumbing, electrical, or HVAC requires a permit, and most work performed by carpenters also requires a permit. This should be done for projects of any size; if a project is too small to require a permit, why bother asking the seller to do it at all? Do nothing. This is often the best option for buyers. When buying a used home, buyers shouldn't expect everything to be perfect; it never is. Walls get damaged, showers leak, appliances age. This doesn’t mean buyers shouldn’t address defects after they’ve bought the house, but it’s unrealistic to expect sellers of used houses to fix every little defect. Asking sellers to address a long list of minor repairs will make the seller feel defensive about their home and make the buyers look petty. This typically comes from a misunderstanding of what a home inspection is for; home inspections are supposed to help the buyer make an informed decision about their potential purchase, not give the seller a long list of petty repairs. 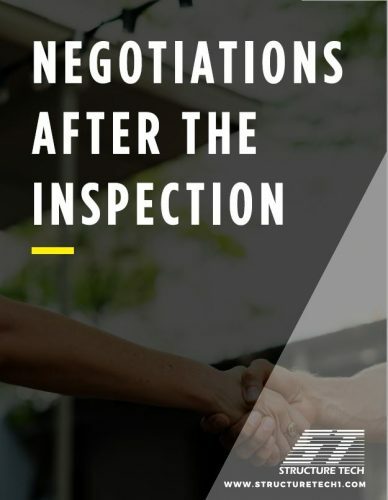 For a longer discussion of this topic, check out our document on this topic, Negotiations After The Inspection.